I am sure you have read many blogs about the Royal Wedding and opinions, thoughts, critiques and praises. As a Chicago wedding planner, I was so excited to watch on Saturday and see all the details and outfits and music unfold. I wanted to share the things that I loved about the Royal Wedding of Harry and Meghan and things that I think you will see in wedding design trends following this historic event. I loved her Givenchy dress designed by Claire Waight Keller. Elegant and perfect for church, the setting and her age. I was hoping to see her in a timeless and classic look, and she did just that. Her hair and makeup were not overdone and her natural beauty was able to shine through. Since they have been engaged I have seen her in the public eye and she takes a classic and no fuss approach to dressing for events. She did not stray from this which I loved and she looked comfortable and beautiful. The veil was the most exquisite thing, and it represented florals from 53 different countries from the commonwealth. What I loved here was it had meaning! Now yes, her hair got a little out of place but this is a wedding, not a styled photo shoot with a hair person standing by to fix every strand of hair at every moment. She got into the beautiful antique car in a long dress and veil, got out of the car outdoors, up the stairs and right down the aisle. It was perfection and real life and what a wedding should be. I loved the smiles and the reaction to when she arrived at the altar by Harry as told her "You look amazing. I am so lucky"! It was just beautiful and perfect and what a wedding ceremony should be with laugher and tears of happiness and intimate moments at the altar between the couple! Her bouquet was a smaller posy bouquet. What was the most meaningful is that Prince Harry picked some of the flowers for her bouquet in the garden and included Forget-Me-Nots, Princess Diana's favorite flowers. Wedding trend to watch: Elegant and classic wedding dresses. Minimal hair and makeup and petite jewelry. Small bouquets with brides selecting flowers that have meaning to them. The outside of St George's Chapel at Windsor Castle was beautiful and decorated top to bottom in beautiful greens and white flowers. Someone asked me whey they did not decorate inside the church? As a destination wedding planner who gets to work at some of the world's most beautiful churches, I feel that churches like St. George's with so much beauty do not need flowers. 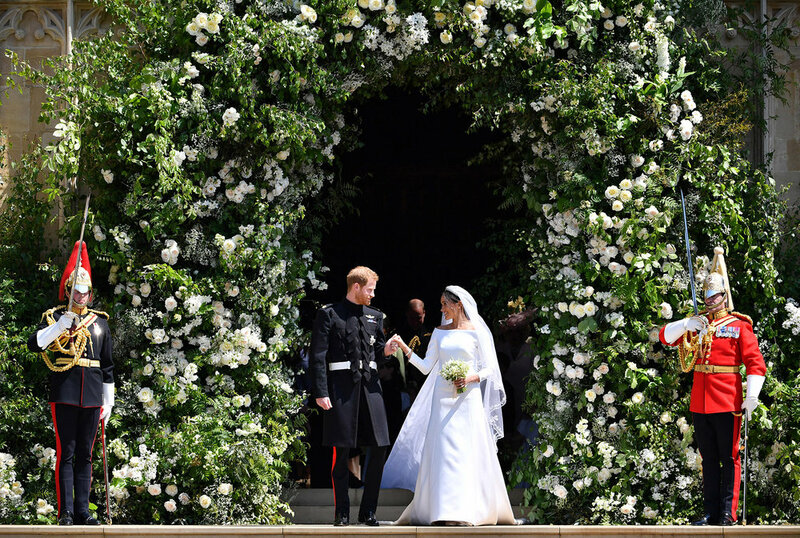 Having the entrance filled with florals was so pretty and was just perfect when they appeared on the steps for the famous first kiss with the whole world watching. Wedding trend to watch: Minimal flowers at the church. Decor outside the church in the form of greens and flowers. This is hands down my favorite part of the day. From the intimate moment between the bride and groom at the altar to the passionate 14 minute sermon by Reverend Curry, to the gospel choir singing Stand by Me and the hymn Guide Me, O Thou Great Redeemer, which was a hymn sung at Princess Diana's funeral and was a lovely homage to her memory. It was everything a wedding ceremony should be, and I sat on my couch drinking English Breakfast tea wiping away the tears of happiness for this beautiful couple's ceremony. Wedding trend to watch: Gospel choirs, choirs at the church, selection of music becoming really important. Focus on the importance of the wedding ceremony. Harry and Meghan's grand exit, kiss and ride in the carriage was a lovely moment for all of Britain and the world to share. It was so nice that they shared their day with the millions of people there who wanted to catch a glimpse of the new Duke and Duchess of Sussex. Their smiles and laughter, waving and looks between each other was such a nice way to end the ceremony, and I I know will be a lovely memory for them both. Long ago my husband and I left our afternoon reception in a horse and carriage and took it down to our hotel. It was my favorite memory of the day. People waved and honked at us and shouted cute congratulations to us. But we also loved that it was just the two of us all alone in the carriage experiencing that moment together. Wedding trend to watch: Fun grand exits and departures from weddings in horse-drawn carriages or antique cars. The bride and groom driving themselves off into the sunset in a convertible. Congratulations to the new Duke and Duchess of Sussex! Thank you for sharing your beautiful wedding day with all of us!